‘Keep It Simple’ is a mantra I apply to most choices. From putting an outfit together to deciding a dinner menu, it works each time. With the onslaught of beauty products it seems difficult to even imagine a skincare routine that is simple and I am always reluctant to add another step or product to the regime. I have been hearing a lot about the sonic cleansing systems over the years, but refrained from even giving it a try as it just sounded like a lot of work. Recently, with all the make-up I have been wearing for work commitments, I felt as if my skin wasn’t completely clean at night (regardless of which make-up remover I used). I decided to give a sonic cleasing system a try and began researching these facial cleansers.I am paranoid about putting anything on my skin and did my homework at length about the pros and cons of using a tool such as this. The Clinique Sonic System is said to have a gentle brush suitable for sensitive, so I decided to give it a try. I purchased the Clinique Sonic System at the Athens airport on my recent trip to Greece and double-checked with my dermatologist before using it. (Note: The Clinique Sonic System is available at the Clinique stores in India). 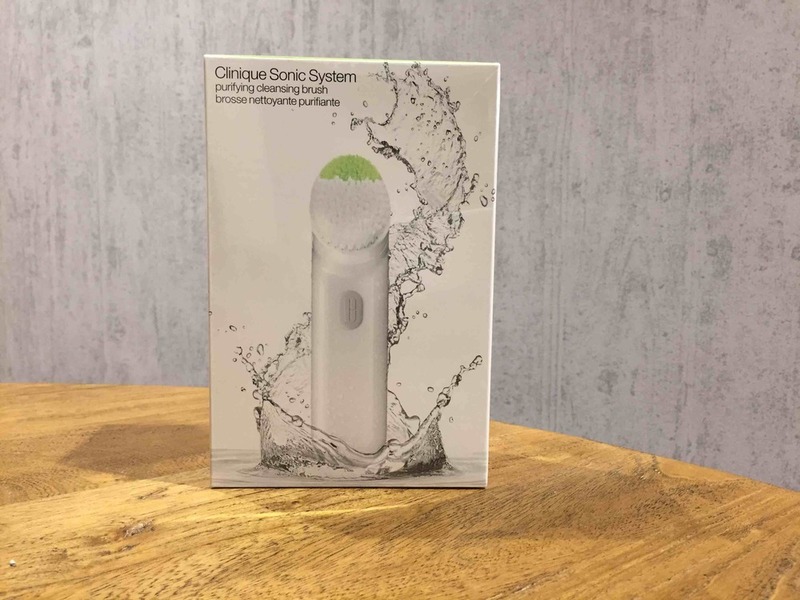 The Clinique Sonic System comes with a waterproof cleansing brush and a charging base with a USB-plug. I quite like the simple and clean design. The product is easy to operate, store and transport. The egg-shaped brush has two types of bristles, the softer white ones for your cheeks and the green ones for the nose. In terms of usage, you simply add your face wash on the brush head and turn it on to gently massage your cheeks, nose, forehead and chin. It is recommended that first time users such as myself, start by using it only 30 seconds at a time. I have been using it only twice a week for two weeks so far and shall increase the frequency gradually. Two weeks is too short a duration to notice any significant difference on my skin. I will say that it does do a great job of removing the excess oil and make-up. My skin does feel cleaner after using the Clinique Sonic System. Why did I buy the Clinique Sonic System over the Clarisonic System? I have really sensitive skin and have been using Clinique products since I was in college. I have never had any issues with their skincare or cosmetic products, so in a way, I trusted the brand name. I was going to give a cleansing system, such as this, a try for the first time and found the latest Clarisonic Mia 2, to be double the price and was hesitant to spend that much on a system I wasn't even sure would work for me. Simply by the touch and feel of the brush, I found the Clinique ones to be softer, assumed they would be more gentle on the skin. Also, with Clinique having shops all over India, I figured it would be easier to get the brush heads which need to be replaced after few months. How does the Clinique Sonic System compare to the Clarisonic System? As I have not used the Clarisonic System, I don't think I can make a fair assessment. However, here are some clear differences between the two products. The Clinique system runs for 30 seconds and then switches off on its on. It does not give you the breakdown of the time it needs to be used on the cheeks, forehead, nose etc. While the latest Clarisonic Mia 2 systems beep each time that you need to move it to a different part of the face. It would have been helpful, if the Clinique system also had a similar time feature. The USB charger in the Clinique system is a big plus; specially if you are someone who likes to travel. Overall, I am really happy with the product and I feel its a good addition to my face cleaning routine. I will be writing a detailed review of the Clinique Sonic System once I have used it for a couple of months. In the meanwhile, if you may have any queries, please do leave a comment below.